Well it has been a long time since I have typed up a review.Many of you know that I am expecting.I am now in my second trimester.I will be taking a much needed break from blogging to take care of myself and to focus on my family. I have actually had these swatches finished for a LONG time but life got in the way of me doing the actual review of these beauties.So much has happened in such a short time,it's unbelievable. I have had pregnancy issues,family and marriage issues,I had to take my dog to have surgery ect. It has been a hectic time around here.I do apologize. 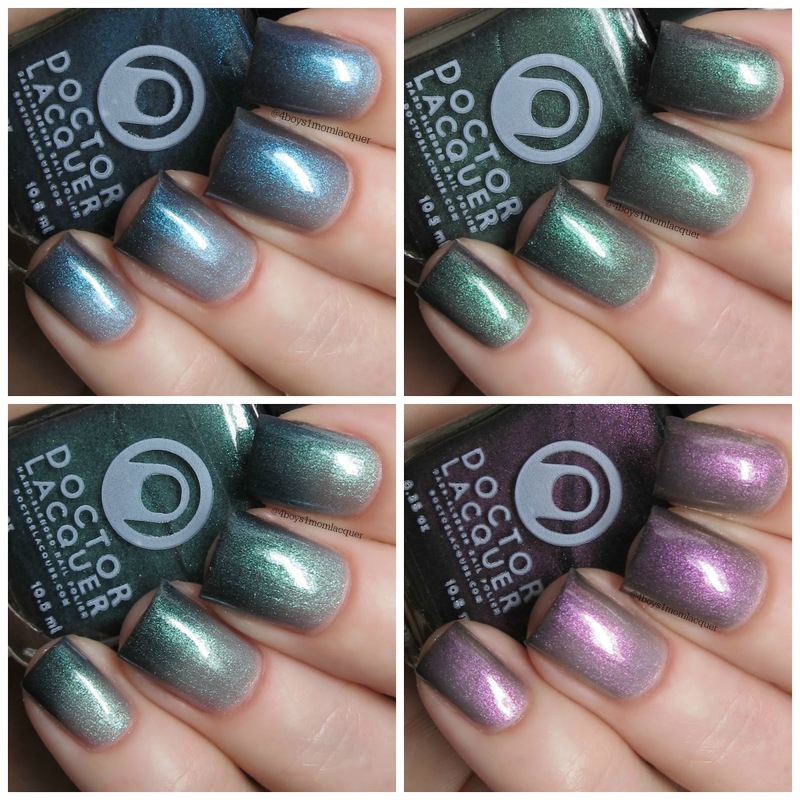 On a better note I have Doctor Lacquer's Something Spatial Galaxy collection to share with you.Let's take a look at them below. Cartwheel is described as a thermal that has color-shifting shimmers that look blue,green,or purple.It has a teal look to it. It's a pale shimmery grey and transforms to a darker teal when it cools. I applied 2 coats followed by a quick drying top coat. Milky Way is described as purple thermal.The shimmer shifts between red,gold and violet.When it's warm it's pale grey and when it;s cold it's a dark violet purple. Whirlpool is described as thermal that has color-shifting shimmer that can look green,gold,red,and purple.When it's warm it is a pale grey and when it's cold it is a deep green. Andromeda is described as a lovely blue thermal and has shimmers that look blue,red, or violet.When warm it has a shimmery grey base,when it's cold it has turns to a blackened blue base. I applied 2 coats followed by a top coat. This collection is now available.For more information on this collection be sure to check out all of Doctor Lacquer's social media sites. 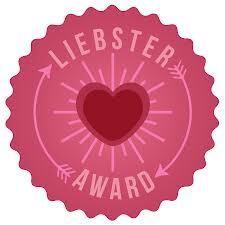 The links are posted for you below. 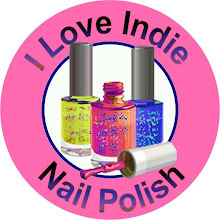 Today I have an amazing and new quarterly indie box to share with you.This box contains five lacquers from five awesome indie brands along with 2 beauty products.You can expect to see items from Aurora Lacquers,Anonymous Lacquer,Lavish Polish,Ever After Polish and the guest for this box this round,ALIQUID Lacquer.This box will be released for pre-sale April 3rd 5pm EDT- April 5th for only $50 for the full size and $36 for the mini+$5.25 for shipping. The name for this box is called Awesome Sauce and is Princess Power themed. Lets take a look at the goodies below. Glimmerella is described as a amazing mash up of jelly and topper! Very similar to a full coverage glitter but made with pink and purple flakies instead. Hot pink micro glitter and holographic shimmer. I applied 3 light coats followed by a quick drying top coat. This polish is actually my favorite in this box.It is so sparkly with the perfect amount of sparkle and glitter.No issues to report. Their are two different scrubs that will be featured in this box. One is a Sea Salt, Sweet Orange and Eucalyptus with coconut oil and vitamin e scrub. While the other is a brown sugar, lavender and tea tree with coconut oil and vitamin e.The one I received is the Brown sugar scrub. 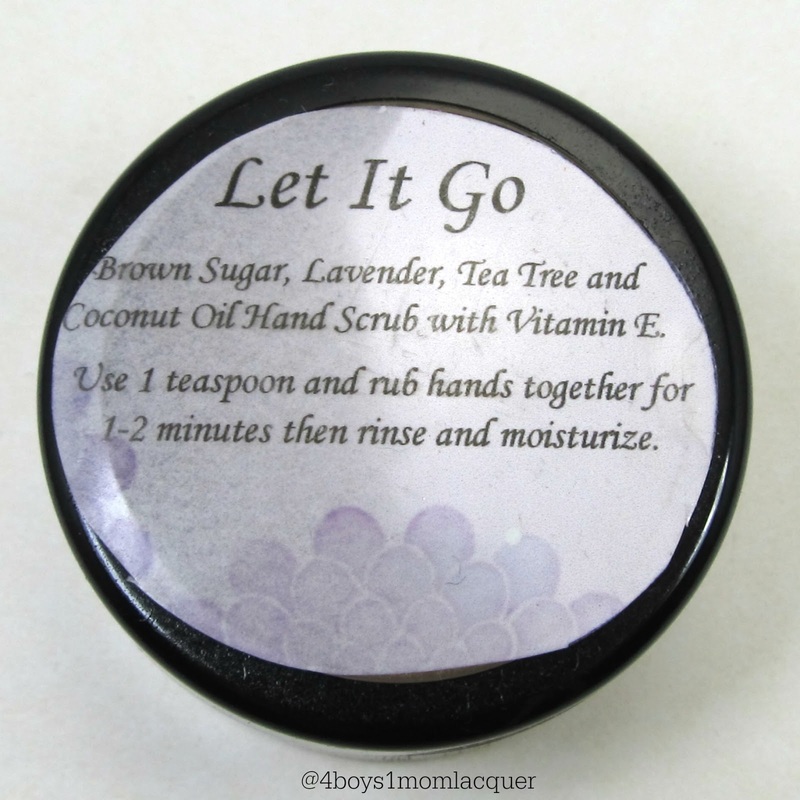 For best results use about the size of a dime and rub between hands massaging tops bottoms and between fingers. After one minute rinse with warm water and towel dry. Use twice a week for amazingly soft hands. 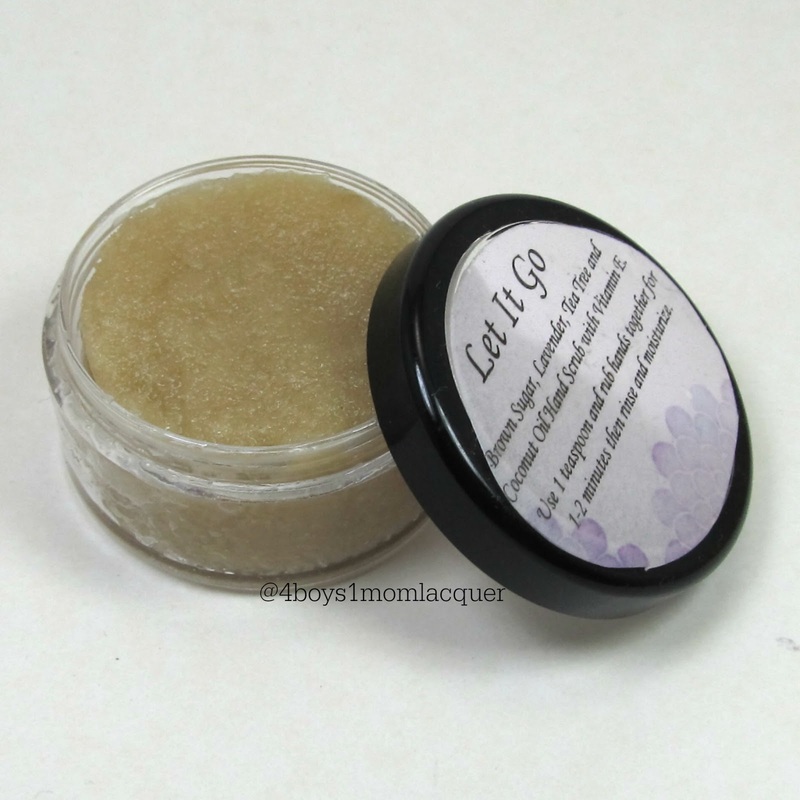 The mini size jar holds r ought scrub to last 8-10 uses or 4-5 weeks. 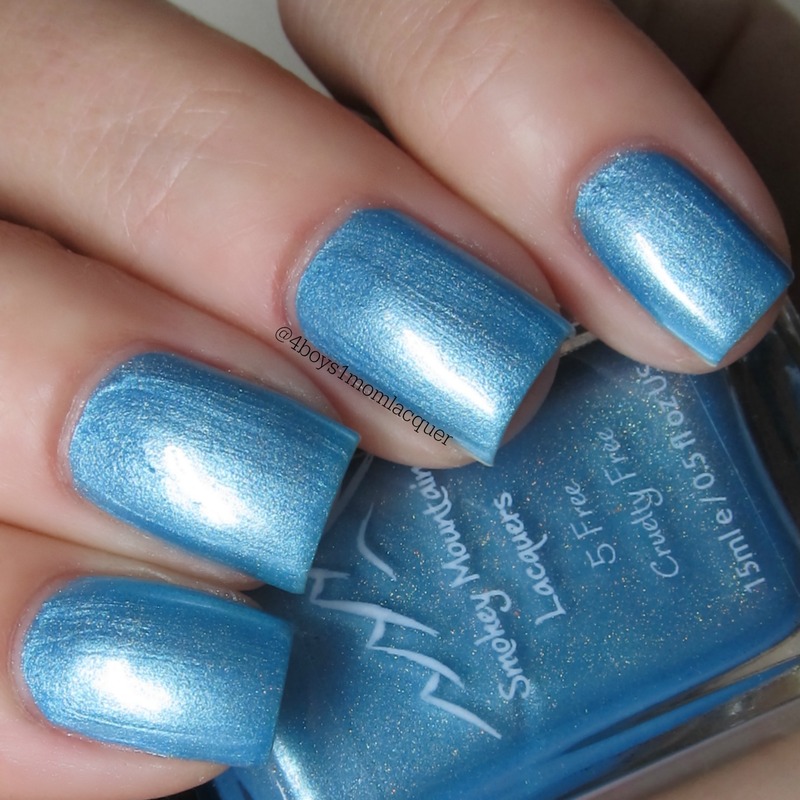 Crystalline Frost is described as a polish with blue shimmers and holo glitter in a light blue metallic base. I applied 2 coats followed by a quick drying top coat.With one coat it does have a opaque finish. This polish applied nicely with no issues.I was not expecting to like this polish,it totally took me by surprise.I really love the color and finish,it shines so beautifully. She Ra's Soldier is described as a metallic holo finish, Shifts from gold to white and silver.I do recommend a base coat. 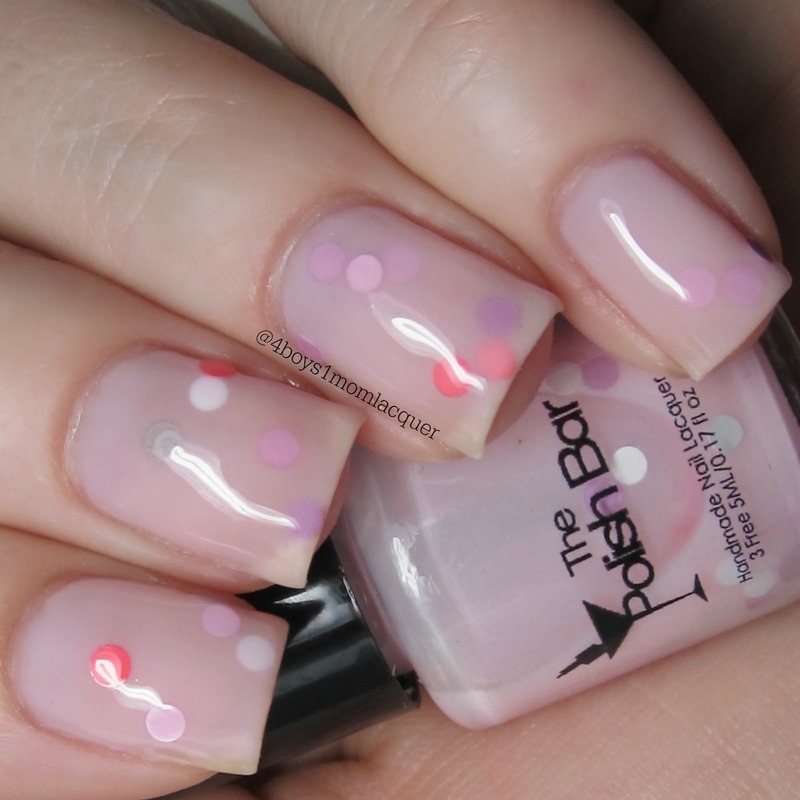 Due to the finish it can show imperfections on the nail. 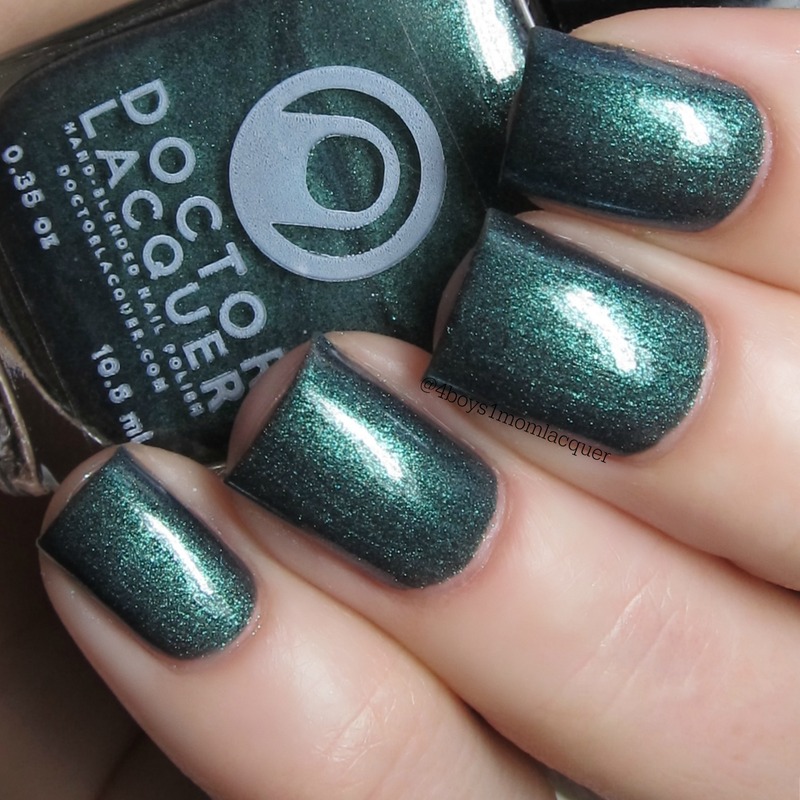 This polish is stunning! I am loving the shifts.This polish applied with no issues.It kind of reminds me of shiny pearl.Beautiful right? She Sees All is described as a glitter topper inspired by Peekablue and her gorgeous feathers it is packed with turquoise, blue and gold holo glitters and gold shimmer. It's beautiful on it's own or over a base color. I applied 1 coat of She Sees All over 1 coat of SinfulColors/Cool Grey followed by a quick drying topcoat. Love this topper!!! The glitter sparkles and the colors of the glitter are perfect together.No issues to report. Undersea Defender is described as a cerulean crelly with iridescent green and blue hexes and green and gold flecks. This is a beautiful blend.The color and mixture of flecks and glitter are amazing.This polish applied perfectly with no issues. This lip balm is handmade and packed with natural moisturizers: mango butter, apricot kernel oil and olive oil (sources of linoleic and oleic acids and vitamins A, C, and E). (4 grams) It applies to the lips so smoothly and leaves your lips feeling moisturized for hours. For more information on this box be sure to check out Anonymous Lacquer.Lavish Polish,Aurora Lacquers,Ever After Polish and Aliquid Lacquer's social media sites.The links are posted for you below. What's your favorite product in this box? You can purchase this box HERE. Today I have another beautiful Spring collection to share with you.It is called the Spring 2015 Collection by Smokey Mountain Lacquers.This collection is now available for purchase.It consists of 8 lovely spring shades.Each polish will retail for $10 for full size and $6 for mini size. 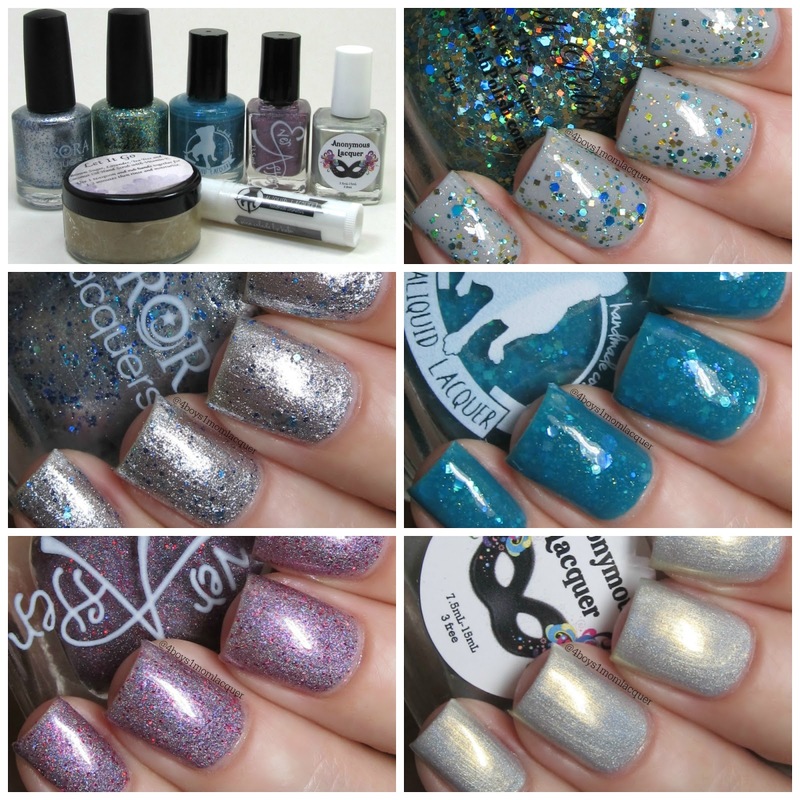 Lets take a look at this beautiful collection of lacquers below. Hello Sunshine is described as a medium golden beige with gold shimmer and glitter that shifts from gold to green to blue. I applied 1 coat followed by a quick drying top coat. 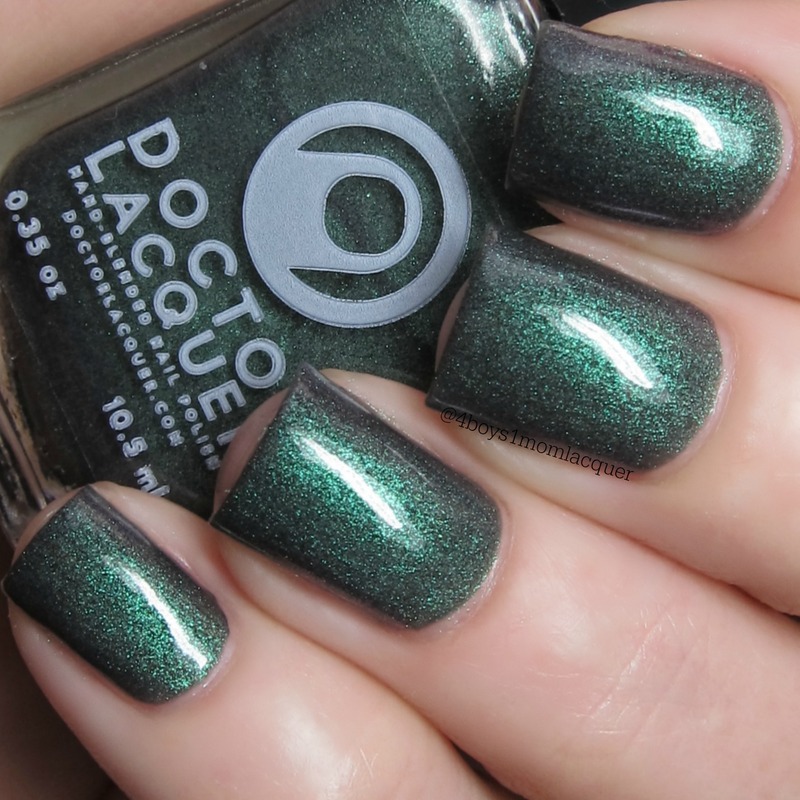 Time Willows Tell is described as a medium teal/mint green linear holo. You Gotta Lilac This is described as a light shimmery purple linear holo with glitter that shifts from red to orange to yellow. Poppy Fields is described as a pink/red linear holo. Life's A Peach is described as a pastel peach linear holo. 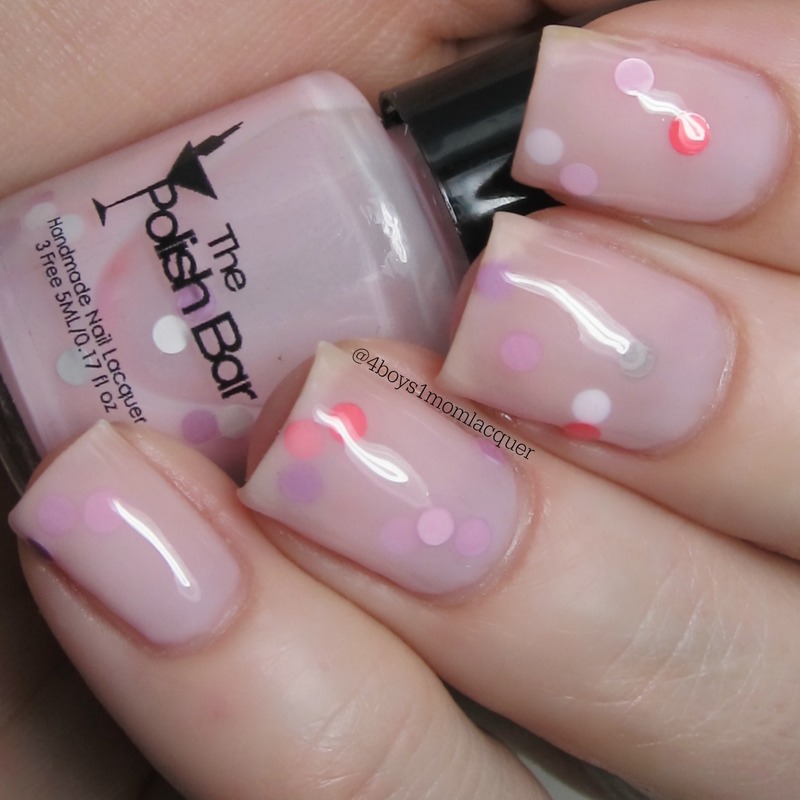 Pink About It is described as a pastel pink linear holo. Heart of Steel is described as a medium grey linear holo with gunmetal flakies. Wild Blue Yonder is described as a light blue linear holo. Overall this collection has some amazing spring colors.Most of these polishes are one coaters but I decided to use 2 anyway.My favorites in this collection are Pink About It,Poppy Fields and Life's A Peach. For more information on this collection be sure to check out all of Smokey Mountain Lacquers social media sites.The links are posted for you below. Which of these spring colors are your favorite?